The steps which I am going explain for removing shortcut arrows is by the method of REGEDIT. If you have some little knowledge about regedit then it is good or else no problem. Open REGEDIT by typing REGEDIT in run prompt (win+r). Click on HKEY_CLASSES_ROOT now without break press LN in keyboard you will see lnkfile (HKEY_CLASSES_ROOT\lnkfile) folder, in the right side you will see IsShortcut file just select and right click and select Delete option. Now we have to delete another registry entry, to do select HKEY_CLASSES_ROOT in that without break type pi you will get one folder called piffile (HKEY_CLASSES_ROOT\piffile) in that folder you will see IsShortcut file, Delete that IsShortcut file. That’s it. 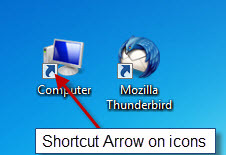 After restarting your PC you wont see shortcut arrows on icons. 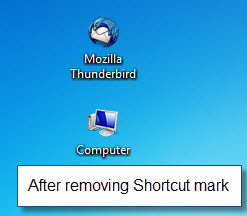 This removing shortcut arrow method works fine on every windows O.S (xp,vista and windows 7) for 32 bit and 64 bit pc as well. This is the first one I found that works with Windows 7. I wonder if it has anything to do with me being no longer able to ‘pin’ programs to the task bar? I have also tried few times to pin programs to task bar as you tried but failed many times even I search on the net for the solution for this and tried all those method but the result if FAIL. For me the way it worked is just going to the original set folder of that program i.e at C:\Program Files (x86)\PROGRAM FOLDER and check for the icon you want to place on task bar and their you try to pin. For me this method worked for one laptop and not worked for anther laptop..